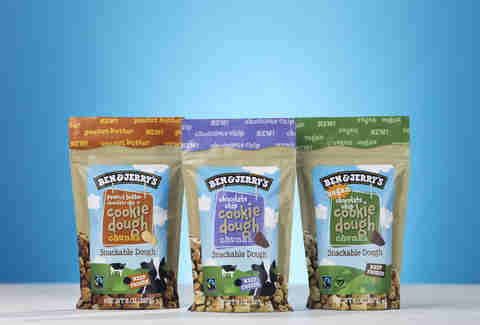 Whenever I try to imagine the world without Ben & Jerry’s cookie dough, I get teary eyed. There might as well be no sunshine, no laughter, or no notification for when you’ve received a text. But the thing about cookie dough is that it’s always surrounded by all this ice cream you just have to eat too. What a scam! 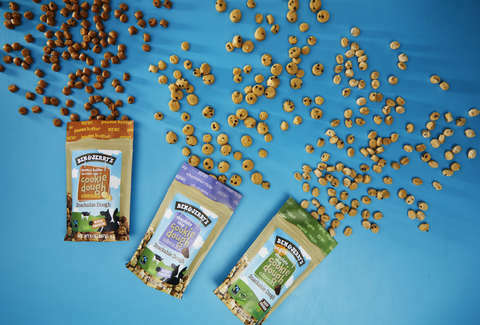 Vermont’s finest ice cream makers have rectified the situation by releasing three new, ice-cream free bags of only cookie dough chunks in three flavors: Peanut Butter Chocolate Chip Cookie Dough, Chocolate Chip Cookie Dough, and Vegan Chocolate Chip Cookie Dough. We’ll tell you which ones are worth your dough. A serving size is two tablespoons?! That’s cute. I will eat everything in this bag. There are seemingly 100 penny-sized chunks of cookie dough in here, and I’m confident that I can mindlessly eat all of them. Especially because after one bite, I’m in ice cream heaven. It tastes like some poor soul worked hard to pull these straight from a pint of P.B. Dough. Probably Ben. Or Jerry. I don’t know their division of labor, to be honest. One morsel is similar in size to how much cookie dough you’d get from one scoop. There’s that tasty peanut butter flavor along with the same soft, glorious cookie dough texture you know and love. The one downside is that there’s so much peanut butter flavor that it overpowers the chocolate chip. Think of it as pure joy for peanut butter lovers. But the texture combined with how cold each piece is makes me want to eat a pint of ice cream. Which is probably the point! The dryness of peanut butter in general and the fact that your body likely assumes ice cream is coming next makes this not as snackable as you’d think. Maybe keep a glass of milk nearby. These are the OG cookie dough chunks, the ones that will go down in the Ice Cream Hall of Fame for changing the damn frozen dairy game in Chocolate Chip Cookie Dough Ice Cream. This bag is a dangerous thing to put in front of someone, because there’s a real fear that you’ll only stop eating when you’re out -- way moreso than you will with the peanut butter chunks. For one, eating these chunks won’t have you running to the fridge to pour a glass of milk. Every piece is pure frozen joy from Vermont straight to you. The chocolate and dough are married in perfect little bites. I don’t miss the ice cream at all. I’ve eaten so many that I’ve forgotten if Ben & Jerry’s even makes ice cream anymore. Who cares, I’m over it. Just feed me these over and over again. I love the non-dairy frozen treats from Ben and Jerry’s -- the P.B. & Cookies especially. But I’ve never had its vegan cookie dough chunks before. Considering they have to compare to the original cookie dough, I’m a little concerned. And after eating a few, I’m not any more convinced that they compare well to the real thing. These chunks are not as rich as the real thing. It’s also frankly not as dry as I thought it would be, as the presence of coconut oil makes up for what it lacks in butter and (pasteurized, safe-to-eat) eggs. For anyone who follows a plant-based diet, this will likely hit the spot! If you have some almond milk nearby, consider dunking these in. We've gone down this rabbit hole before, but I still needed to know what would happen if I stuck these in the oven. It seems like a great idea, an alternative to Toll House. Unfortunately, I neglected to watch this handy Thrillist video, which advises the best way to bake cookie dough is take tiny cookie dough pieces, line them up, and bake at 400 for 7-10 minutes. Instead, I tried to bake enormous clumps of cookie dough together in the hopes of making three great super cookies to rule them all. I set the oven at 350 degrees for 10 minutes. Everything backfired. 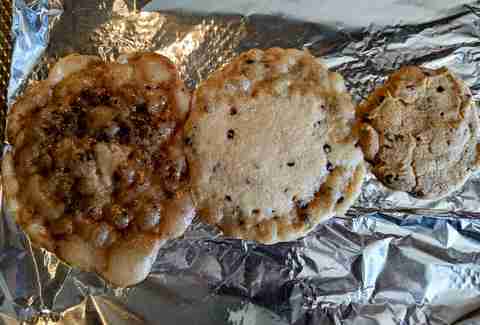 The vegan dough (on the far left) did not enjoy being cooked one bit, while the peanut butter and original cookie dough just formed into super ooey-gooey messes that maybe one day could turn into a cookie if they were prepared properly and baked for longer. Despite my screw-ups, the cookie-ish forms still tasted good. Maybe pass on baking the vegan dough. That doesn’t look safe to consume. And when you eat the cookie dough, no matter if it’s in frozen chunk or baked cookie form, have a glass of milk at the ready. Lee Breslouer writes about food and drink from Colorado, posts photos of ice cream pints @LeeBreslouer, and can't wait for Ben & Jerry's to make a pint of cookie dough with little chunks of ice cream in it.